(Photo:REUTERS / Ronen Zvulun)Patriarch Kirill (C), the head of the Russian Orthodox Church, visits the Church of Mary Magdalene on the Mount of Olives outside Jerusalem's Old City November 12, 2012. GENEVA - Talk of a Holy war in Syria is deeply worrying U.N. advisers and the second ranking United Nations official says the religious or ethnic partition of Syria would be part of an extremely dangerous trend. 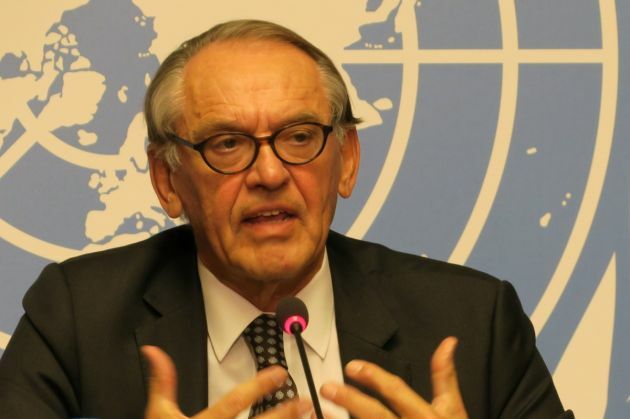 U.N. Deputy Secretary General Jan Eliasson spoke to journalists in Geneva Oct. 15 and was asked to comment on growing fears of a partition of Syria expressed by mediating officials. "Any division of a country is a very painful process and can just lead to a continued civil war. I would, both in the case of Syria and in the case of Iraq, strongly make the case for keeping the nations together. "I say this also from the perspective of a fear that I have that ethnic and religious factors divide nations more and more. This is an extremely dangerous trend," said Eliasson, a former Swedish foreign ministry official. He said there is diversity in practically every nation which is a source of richness. "It might seem easy way to divide countries to solve the problem, but what you do in fact was you build in, you confirm that religious and ethnic divisions legitimize the separation of a country. Earlier in the week two senior U.N. human rights specialists expressed alarm at the rise in violent rhetoric by influential religious leaders - including calls for "holy war" against certain faiths - in relation to the situation in Syria. The U.N. Secretary-General's Special Adviser on the Prevention of Genocide, Adama Dieng, and Special Adviser on the Responsibility to Protect, Jennifer Welsh issued a joint statement after pronouncements from religious leaders. In it they condemned the recent call by clerics in Saudi Arabia for Sunni Muslims and their States to support a "holy war" against Shia Muslims and Christians in Syria, as well as against States and non-State armed groups perceived to support them. "Such rhetoric can aggravate the already extremely volatile situation in Syria by drawing religiously motivated fighters to join all parties to the conflict, thus escalating the risk of violence against religious communities," said the advisers. They noted that "advocacy of religious hatred to incite or justify violence is not only morally wrong, but also prohibited under international law." Dieng and Welsh also expressed concern at reports that Russian Orthodox clerics had referred to the Russian participation in the conflict in Syria as a "holy battle" against terrorism. That came after Patriarch Kirill of Moscow and All Russia expressed hopes on Sept. 30 that Russia's participation in the solution of the Syrian conflict will bring peace to the region, Russia's Interfax news agency reported. "The Russian Federation has made a responsible decision on the use of armed forces to defend the people of Syria from the sorrows caused by the arbitrariness of terrorists. 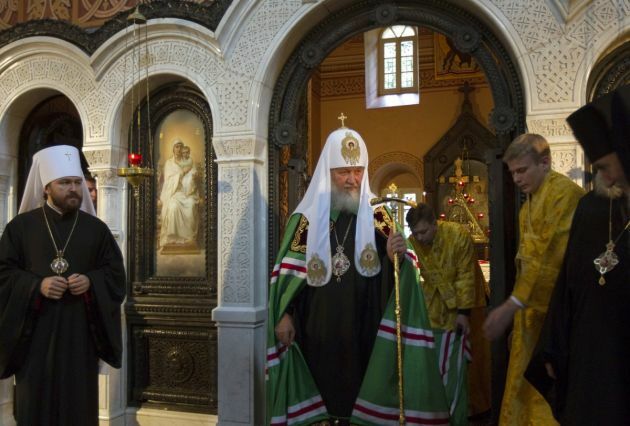 "We believe this decision will bring peace and justice closer to this ancient land," the patriarch said in a statement quoted by the press service for the Synodal Information Department, Interfax reported. "Wishing peace to the peoples of Syria, Iraq and other countries of the Middle East, we pray for this tough local conflict not to develop into a major war, for the use of force not to lead to the death of civilians, and for all Russian military [personnel] to return home alive," the patriarch said. "We know about the catastrophic situation that the people who have become the targets of extremists and terrorists are now in, and not from hearsay, but from personal meetings with the religious leaders of the Middle East," he added. Then on Oct. 2 Agence France-Presse quoted Russian Orthodox Church spokesman Archpriest Vsevolod Chaplin telling Interfax, "The fight against terrorism is a holy struggle and today our country is perhaps the most active force in the world to combat terrorism." Dieng and Welsh said, "Statements of this kind can be manipulated, feed suspicion and increase polarization of communities." The special advisers also noted the response by Russian authorities, who reportedly denied that there was any religious connotation to their involvement in Syria. They praised the organization Syrian Christians for Peace for rejecting the concept of a Christian "holy war" and condemning those who invoke it. The U.N. advisers called on States to dissociate themselves from and condemn any form of advocacy of religious hatred. They said they should promote dialogue and protect and empower all those religious figures and human rights defenders who are working towards enhancing interreligious respect and harmony. The officials also called on religious leaders around the world to refrain from any form of advocacy of religious hatred and incitement to violence. They said they should counter any use of such rhetoric, emphasizing that "religious leaders should be messengers of peace, not of war." "In situations in which tensions are high, as in Syria, religious leaders should call for and foster restraint and dialogue, rather than fanning the flames of hatred," they cautioned. (Photo: © Peter Kenny / Ecumenical News)U.N. Deputy Secretary General Jan Eliasson speaks to journalists at the United Nations in Geneva on Oct. 15, 2105.